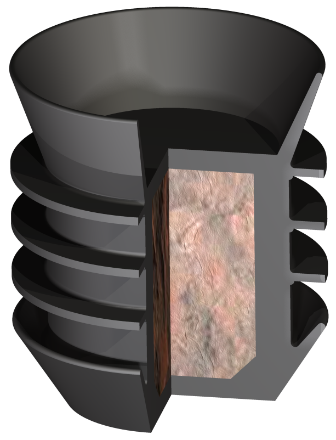 Industrial Rubber Cementing Plugs are engineered for reliability. The Top Rubber plug and Bottom Rubber Plug are of the same basic design with firm wiping action provided by five wiping surfaces. 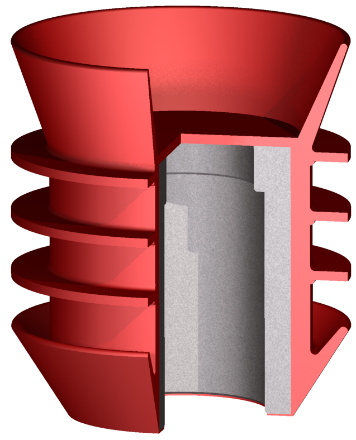 The cup design on top and bottom of both plugs provides a sure seal against the casing wall to prevent mixing of cement slurry and displacement fluid. The Top Plug seats into the Bottom Plug and seals against it to lessen the possibility of additional cement slurry displacement, while also promoting good bonding at the bottom of the casing. The Top Rubber plug has a core of epoxy coated sand compressed into a solid mass, which allows the plug to withstand shock when pumped to touchdown, while also retaining its ability to be drilled out. The core is completely encased in rubber and has a solid base to prevent separation. The Bottom Rubber Plug has a core of cast aluminum that is PDC drillable. After the plug has completed its wiping of the casing ahead of the cement slurry and seated at touchdown, additional pump pressure will rupture the rubber diaphragm at the top of the core, allowing slurry to continue to its destination. Size Part No. Part No. Part No.